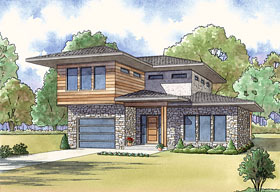 This stunning and unique house plan is sure to catch the eye with its mixed siding, clean lines and modern design. Step into the open living area and kitchen, the perfect set up for any family to be able to spend more time together. Bedroom 3 is privately tucked away on the left side of the home while bedroom 2 and the master suite are located on the top floor, each with a bathroom.